Thank you to all that attended our 2016 Annual Meeting! Click HERE to access the meeting report, including issue briefs from each panel. 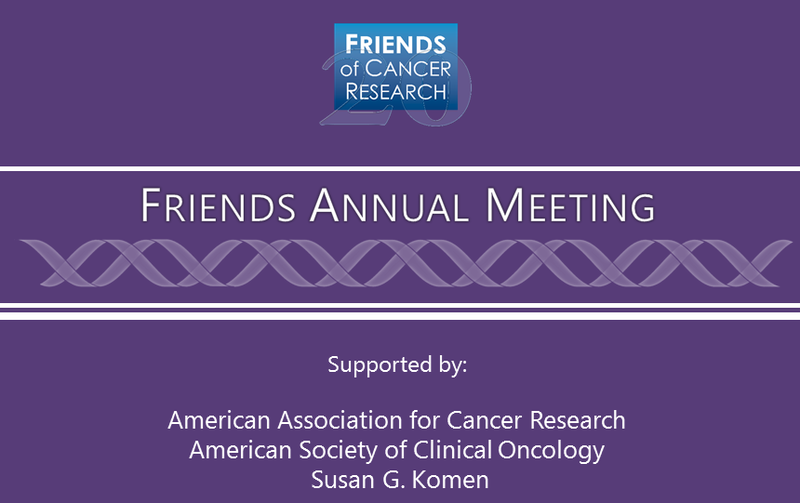 On November 16, 2016, Friends of Cancer Research (Friends) hosted its Annual Meeting. This year’s event started with a keynote conversation between Dr. Doug Lowy, Director of the NCI and Dr. Rob Califf, FDA Commissioner and was moderated by Ellen Sigal, Friends Chair & Founder. Dr. Lowy emphasized the importance of funding, as well as communication both internally and externally with other organizations. Dr. Califf discussed the need for clinical trials to evolve and the issue of data sharing. 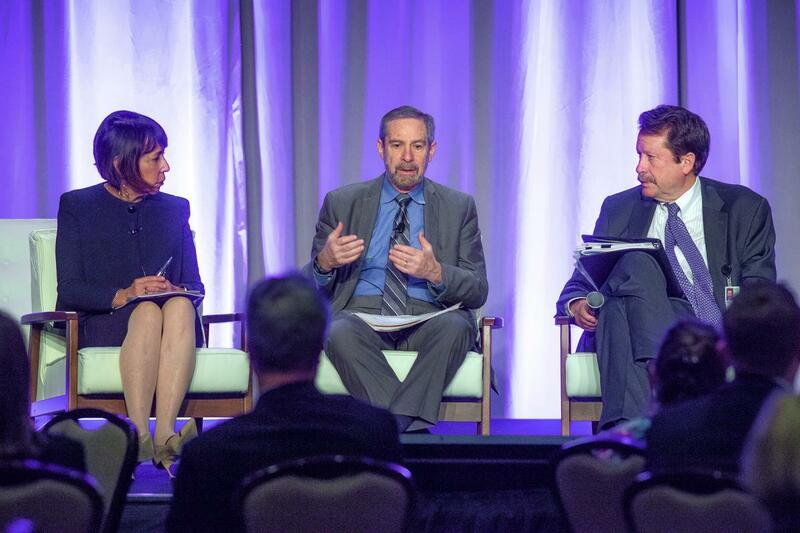 Both Dr. Califf and Dr. Lowy agreed that the issue of data sharing needs to be further addressed. 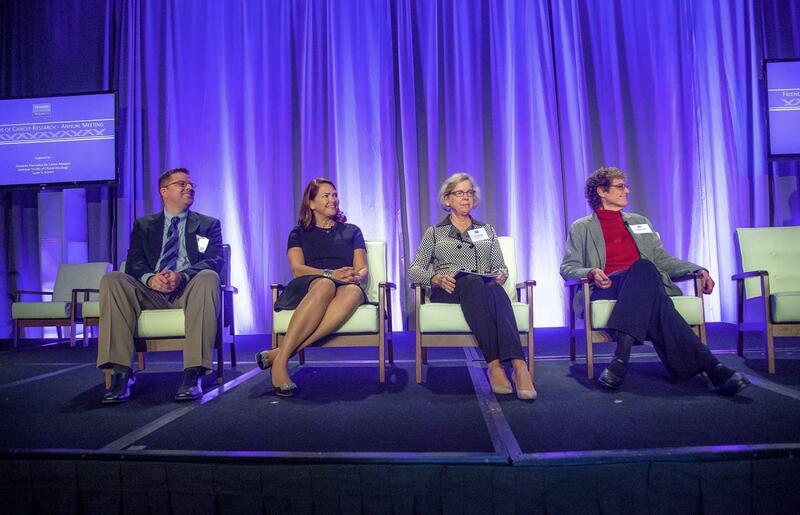 The first panel discussed how eligibility criteria, which are necessary to define the patient population under study, can be appropriately expanded in clinical trials. While restricting trial entry to a homogenous group of patients helps to isolate the potential effect of an investigational drug and ensure that the trial is conducted safely, overly rigid criteria may impair trial accrual, restrict patient access to investigational drugs, and limit the ability to generalize the results to the broader population of patients who ultimately use the drug after approval. 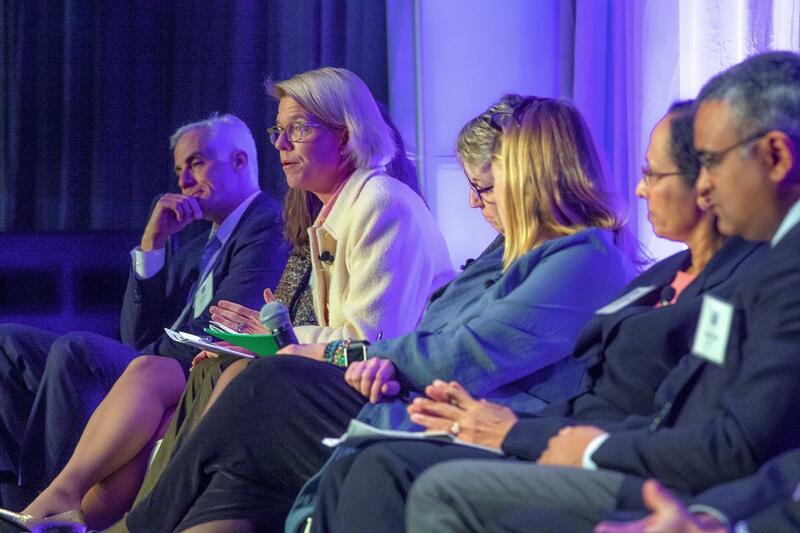 Nancy Roach, Founder and Chair of Fight Colorectal Cancer, highlighted the importance of the topic by discussing how real-world patients can be harmed in the post-market setting when they are treated with drugs that have only been studied in a select group of patients. 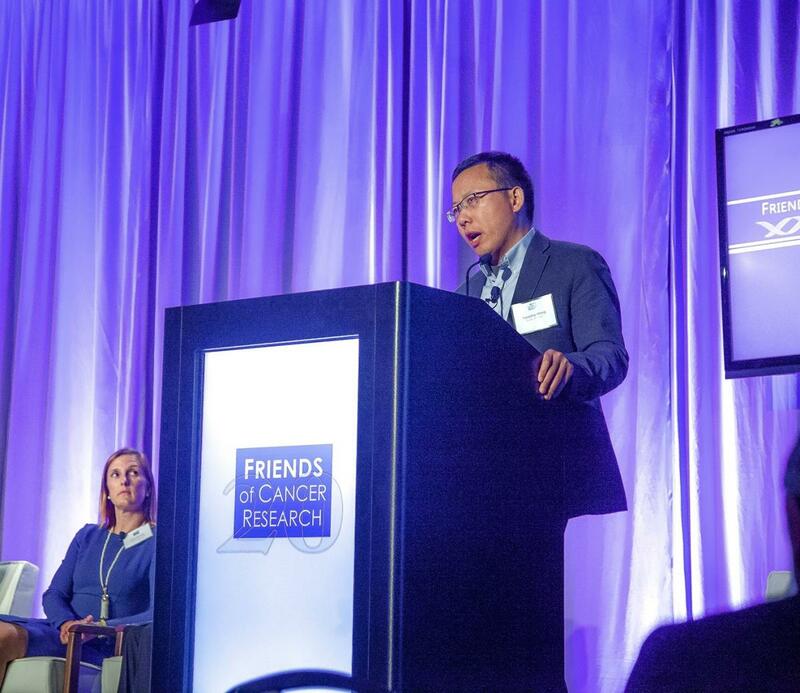 The panel, led by Dr. Ed Kim of Levine Cancer Institute, presented the recommendations of the ASCO-Friends working groups to expand trials to include patients with brain metastases, HIV, organ dysfunction, prior malignancies, and patients under the age of 18. While detailed recommendations for each of these will be published early next year, all share the common theme that trials should aim for inclusivity unless there is a clinical rationale to exclude a patient group. Dr. Paul Hesketh of Lahey Health provided data from the National Clinical Trial Network that demonstrated how trial accrual is improved as certain restrictions are relaxed. Dr. Pratik Multani of Ignyta presented an ongoing trial (STARTRK-2) with broad entry criteria – demonstrating the feasibility of this proposal and providing a model for future studies. Dr. Raji Sridhara of FDA closed by discussing potential trial designs sponsors could use to implement broadened eligibility and how this could impact the label. Future efforts will include data-driven efforts to identify other opportunities to safely broaden clinical trials, creation of standardized and consistent language for trial protocols, and engaging institutional review boards to ensure that patient safety is appropriately balanced with access to investigational therapies. The second panel complemented the first by outlining approaches and considerations for collecting real-world evidence in the post-market setting and using it to support regulatory decisions. Broad use of electronic health records, as well technological advances in data capture are raising the potential for information collected as part of healthcare delivery to be used to support the observed clinical benefit of a new drug and supplement post-marketing commitments or label claims for additional indications where few treatment options may exist or where randomized controlled trials may not be possible or acceptable to patients. Data that is routinely collected in the daily practice of medicine is reflective of the heterogeneous patients seen in real world practice, and therefore this real-world data may better reflect the general population and the care they receive. Jane Perlmutter, cancer survivor and Founder and President of the Gemini Group, framed the importance of this topic by saying that we can learn while we are helping patients. Dr. Gideon Blumenthal of the FDA led the panel by introducing three potential use cases for which pilot studies could be developed to assess feasibility and utility of real-world data: observational post-marketing data in rare cancers, observational follow up of post-progression cross-over cohort in a randomized controlled trial, and a pragmatic randomized controlled trial exploring two different dosing strategies. For each of these, Dr. Michael Taylor of Genentech discussed potential study design and methodological issues, as well as considerations related to data quality and operational issues such as informed consent, patient-level data submission, auditing of source data, data standardization across EMR systems, and linkage of EMR and claims data. Dr. Amy Abernethy of Flatiron Health presented potential applications of real-world evidence for each of the three use cases and said there is an evolving portfolio of examples where electronic health record-generated real-world evidence can be used in service of regulatory and clinical decision-making, but they must incorporate rigorous analysis plans and technology tools to support efficient understanding of information and rigorous assessment of outcomes is critical. The lunch conversation this year was between Dr. Richard Pazdur of the FDA, Dr. Francesco Pignatti with the European Medicines Agency, and Prudence Scott with Medex Consulting in Australia. The three health leaders discussed issues in global harmonization in regards to drug development. 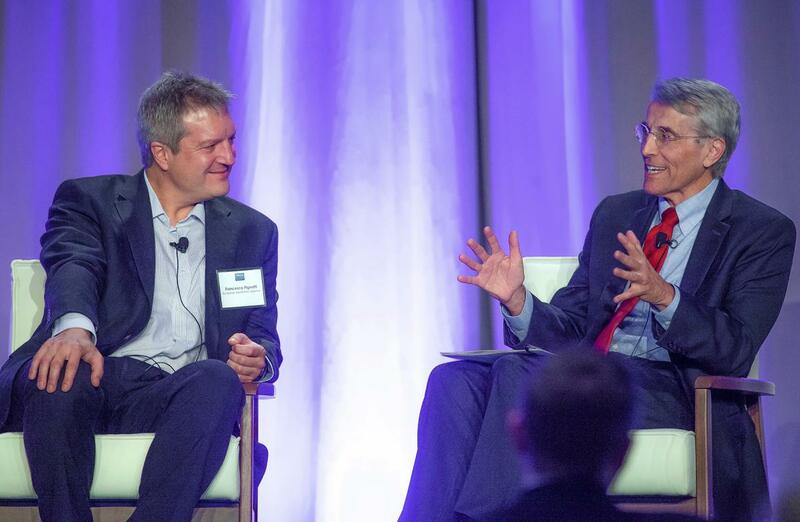 Dr. Pazdur and Dr. Pignatti discussed both the similarities and differences between the FDA and EMA’s approach to drug development and regulation, and all three agreed that further conversations should be had before developing regulatory programs that could be used globally. The day’s final panel discussed potential paths forward when unexpectedly large improvements in overall survival are observed in early phase randomized studies, a scenario that is occurring with increasing frequency. Since these are exploratory trials, primarily initiated to guide “go/no-go” decisions in product development, they are typically not designed with the necessary statistical rigor for definitive assessments of clinical benefit. Therefore, using these trials as the basis of a regulatory decision without further study may present challenges. However, only using the data for a “go/no go” decision and initiating a separate randomized phase 3 trial may also be problematic depending on how compelling the exploratory trial results were, as well as the level of unmet need. The panel, led by Dr. Lisa LaVange of the FDA, discussed the optimal conduct of early phase randomized trials, potential frameworks that can be put in place prospectively for the controlled expansion of exploratory trials, and statistical approaches that can be used by sponsors or FDA reviewers to help interpret the results in the absence of pre-specification and determine how to proceed in the event of unexpected, but promising survival signals. Dr. Amy McKee described recent examples at the FDA where small, activity-estimating, randomized trials have read out with unexpected results on secondary endpoints. She explained that this presents a regulatory conundrum for the FDA in determining how to proceed. Dr. Rich Simon, NCI, presented a Bayesian statistical model that could be used to assess the clinical significance of an unexpected survival result in such a trial. Dr. Yanping Wang of Eli Lilly discussed contextual considerations important for the interpretation of unexpected results, including the size of the treatment effect, consistency across subgroups, and study conduct. He commented that prospective planning of trial expansions for every randomized exploratory trial would likely not be feasible, but simple expansions may be possible. Eric Kowack of Ignyta highlighted other critical factors that sponsors must also consider when evaluating early phase randomized studies, such as chemistry, manufacturing, and controls (CMC) and the adequacy of the safety database.